Harry Potter and the Cursed Child - I've been waiting months and months for this book. The HP fans were told that Book Seven (released in July 2007) was the last book in the series, and everyone sadly accepted this... so the idea of another HP book was just magical. We couldn't be picky when this new "book" was explained. HP and the Cursed Child is actually a play? No problem. It's in script format? Alrighty. It was only partially written by J.K. Rowling? Bring it on. Okay, actually, I was a bit hung up on the fact that the book was in script format... and I was considering boycotting. And then the book actually came out. And all I wanted to do was get my hands on it. I told myself I could wait until my hold came up at the library... that lasted all of one day, and then Harry Potter and the Cursed Child found its way into my red cart at Target. I ended up finishing the book in just a couple days - which is pretty unheard of with a three-year-old. I was just enjoying it that much. It was all about the opportunity to be back in "the wizarding world" and to continue the life events of the characters I loved and read about for so many years - and to see where they were nineteen years later! The book largely centered on the sons of Harry Potter and Draco Malfoy, who were just kids in the HP series. There's a fair bit of guessing who's motives are pure throughout the book, but it keeps its cast of charters pretty small as it's an actual play, being performed in London right now. The script format was not my favorite. I commented to husby that it made the reading a bit choppy, but I did get used to it. The plot was clever, and I enjoyed getting a glimpse into the life of grown-up Harry Potter and family, though the original cast of characters, now grown-ups, were kept at arm's length the whole book. This kind of served to remind the reader that the book was not in fact part of the series, but something totally different. 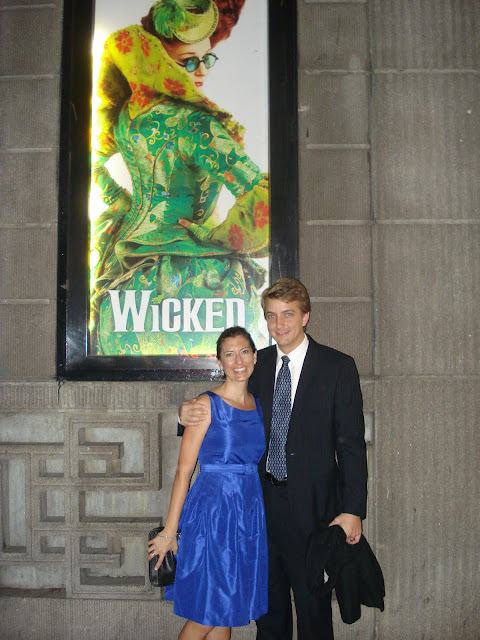 We had just seen Wicked at the Apollo Victoria Theatre- though trips like that were much easier P.P. (pre-Parker), ha! I've been back and forth of whether I wanted to read it or not. I think I'm going to!